Having studied photography at art school, it’s easy to see how Michael Robbins’ eye for the creative translates into woodworking & furniture making. Every element of Michael’s work has a simple but meticulously crafted sensibility down to his website design and video about his workshop. The video even earned a Vimeo Staff Pick. Founded in 2011, Michael Robbins designs and produces furniture in a former wool factory in New York’s Hudson Valley. Drawing from simplicity, utility and a joy of form, Robbins creates pieces that are exceptionally well made out of time honored materials. A 7th generation native of Upstate New York, his furniture is carefully designed to reflect the simple beauty of his rural landscape. Two of Michael’s pieces which are showcased at Hudson Woods, embody many of the features of the Hudson Valley lifestyle. Michael is mostly a self taught furniture maker, an idea he embraces for it’s sense of individuality and freedom to experiment. Interested in the relationships his forms have with one another, and continuing to build upon that aesthetic, Robbins is slowly creating an environment of pieces that are both rustic and modern, while maintaining the comfort and quality of everyday life. 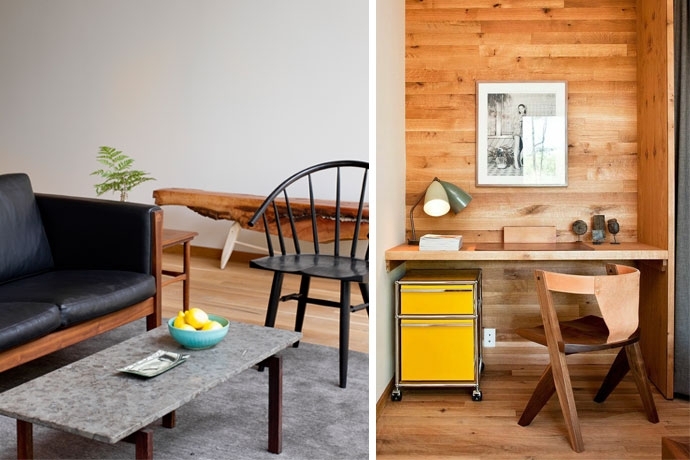 Hand built by a small group of hands in a building rich with manufacturing history, Robbins connects to the spirit of the craftspeople before him, designing quality wooden furniture for today. Pictured above on the left, the Big Bend chair can be found in the great room at Hudson Woods. On the right, the Wickson chair fits nicely in the bedroom nook.